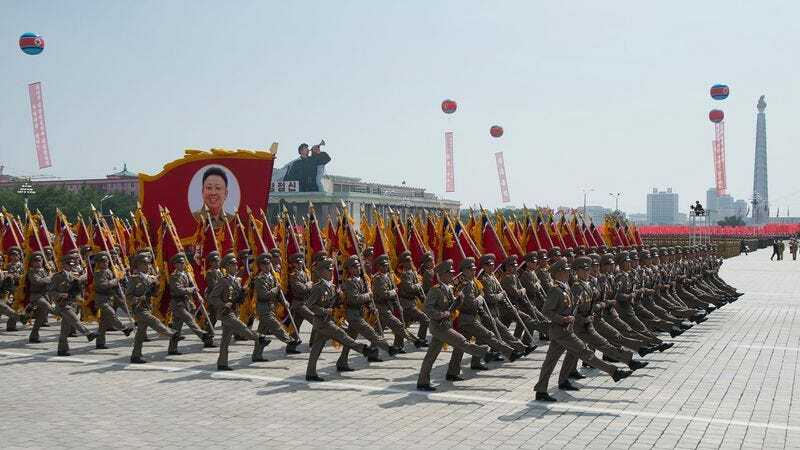 ARLINGTON, VA—Drawing on satellite data and foreign intelligence reports, Pentagon officials confirmed Monday that North Korea was in the late stages of developing a military parade with an operational range of 5,000 miles. “With its current capabilities, the DPRK could, at a moment’s notice, deploy a lavish parade to the Japanese mainland or Guam, potentially expanding the reach of its festivities to the West Coast of the United States by year’s end,” said Deputy Secretary of Defense Robert O. Work, who explained that the communist dictatorship had bolstered its arsenal of massive full-color Kim Jong-il and Kim Il-sung banners, and that its top choreographers were drilling soldiers on how to maneuver in dazzling synchronized formations for maximum visual effect. “We estimate that by early 2016, several major U.S. population centers, including Seattle and Los Angeles, could be within their sights. And if this progress goes unchecked, American citizens could one day wake up to the sounds of the Korean People’s Army State Merited Chorus and Ensemble, followed by the horrific spectacle of 20,000 people dancing in matching traditional costumes as a solitary, weeping woman sings songs in praise of Kim Jong-un.” Pentagon sources confirmed that any test of a North Korean military procession would be the country’s first since 2010, when a parade veered sharply off course and wound up in the East China Sea.